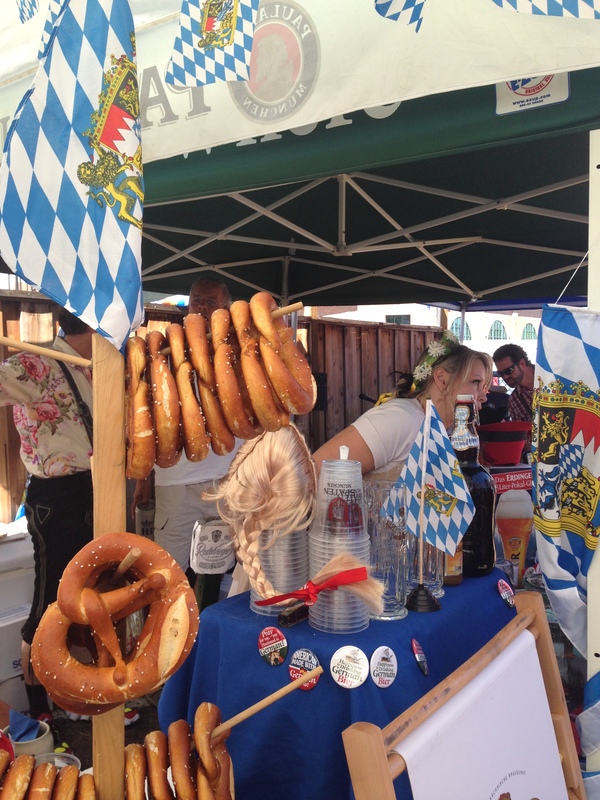 Had the best day yesterday in Alameda drinking beer and eating great German food at Speisekammer Restaurant & Bar. We ate Falscher Hase or meatloaf and mashed potatoes and had Reibekuchen which is potato pancakes served with an apple compote. 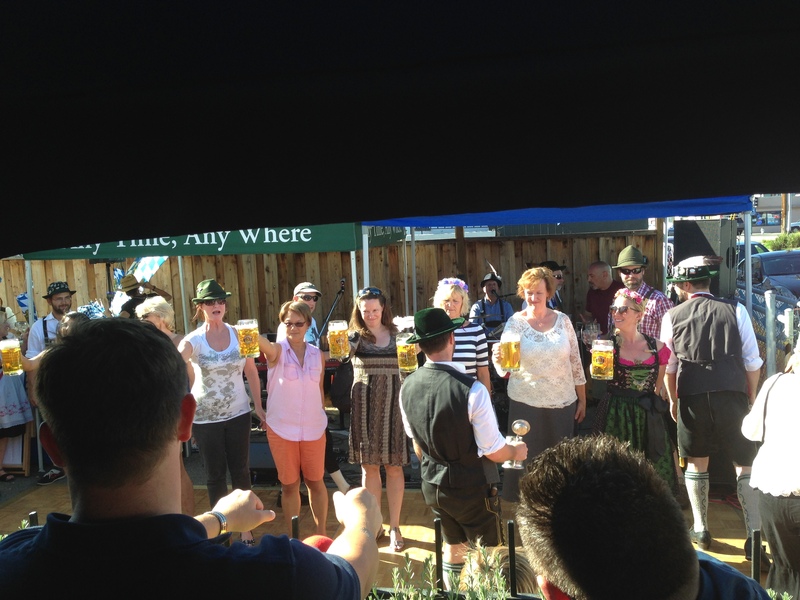 This place is right in line with what Germany must be like. The people were all decked out in their dorky hats and overalls. The women even had fake flowers pinned to their hair all nestled into their buns or braids.Loved the contest to see how long one of these women could hold up a mug of beer. The winner got a free beer, which made it even more fun to watch. I couldn’t help but think of my Dad because he would have loved it. He is always looking for a good potato pancake, one like his mother would make. 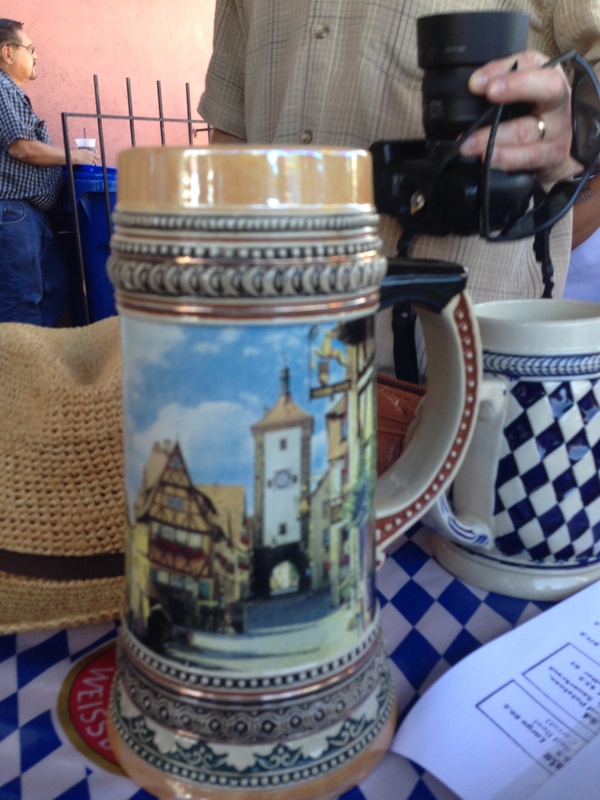 Here is one of the many contraptions that the guests would drink out of. Oh and I wanted a warm pretzel so bad! 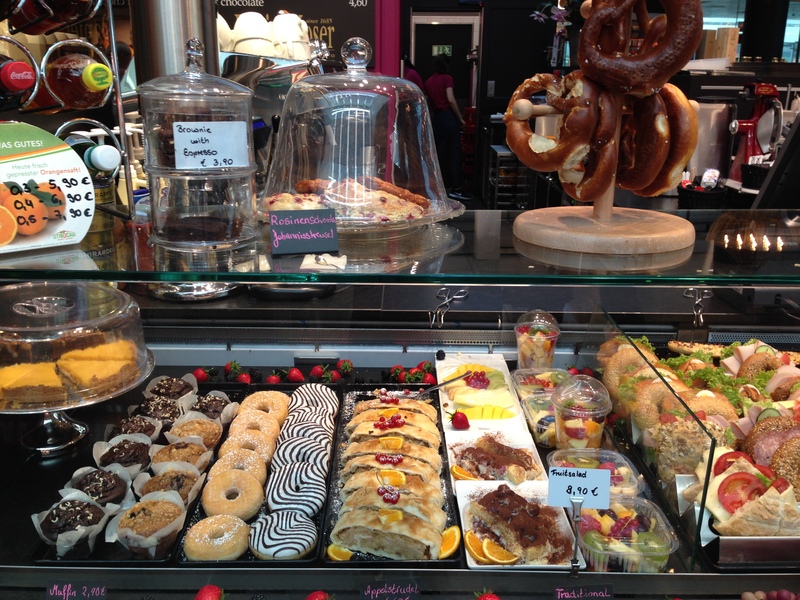 Here is a pic that I took at the Frankfort Germany Airport a few months ago.See how the restaurant used the same pretzel stands? I totally missed out on seeing the dessert menu and I am really bummed because I read on Yelp about their strudels. I need to go back to try it, but for now I can make my own at home. 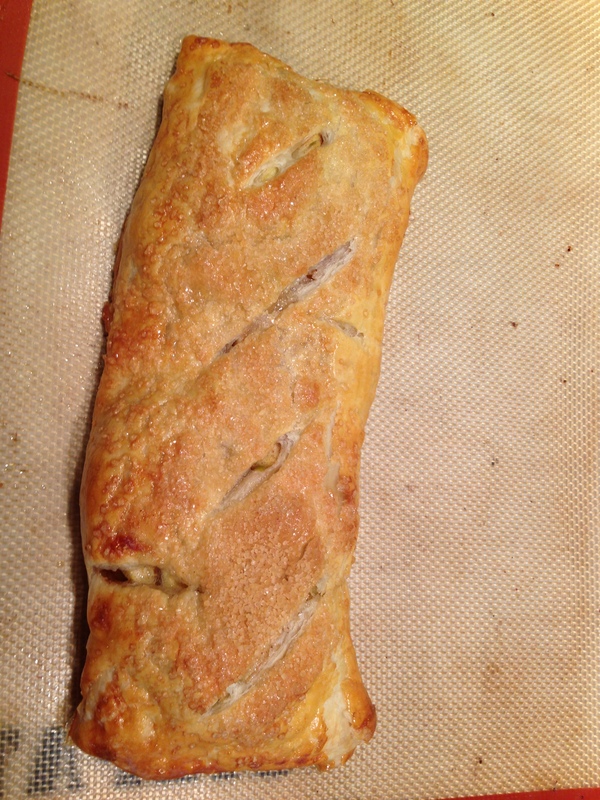 Here is my version of Apple Strudel. Take a small handful of flour and spread on counter. Take dough and separate by opening up and lay it flat onto counter onto flour. Use a rolling pin to roll out dough into a long rectangle. Cut apples thinly and sprinkle with lemon juice. In a small bowl mix sugar with cinnamon. Pour sugar mixture onto apples and mix so that all the apples are coated in sugar. Place apples along the edge of long side of dough. Place butter pieces on apples. Roll dough up keeping the apples inside of pastry. Pinch dough to make sure it is sealed and place onto a sil pat baking pan or a greased sheet pan. Brush pastry with the egg wash and sprinkle with more sugar. I like to use the coarser sugar for this. Cut into pastry 3 or 4 times at an angle to let steam out while baking. Bake for @ 20-25 minutes or until apples are bubbling a little on top and the top pastry crust is golden. Craving a bakery made scone that you can make at home? When I think of scones, I think of eating a healthy morning treat. 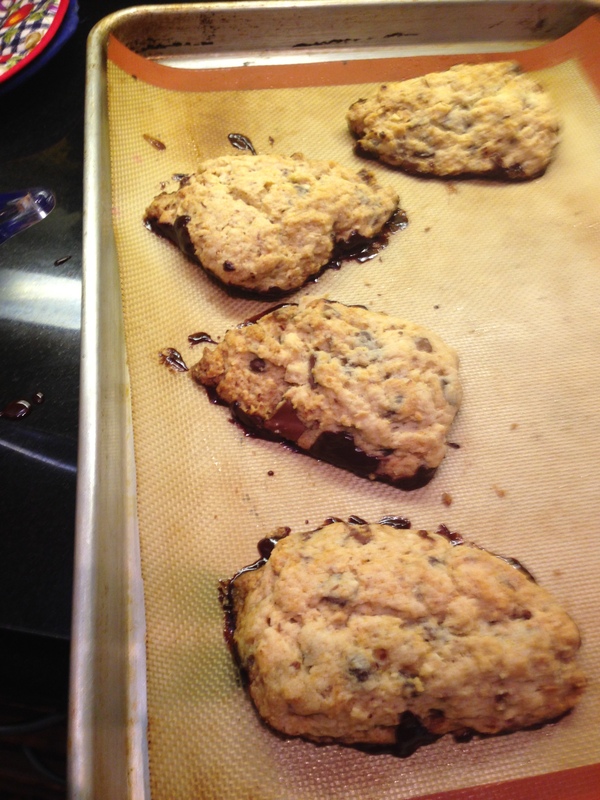 This scone recipe is not something you will eat when you are dieting. No. This scone will elevate your day and bring you so much happiness that you won’t care that it is bad for you. In fact, after you take your first crumbly bite you will reminisce about taking a bite of a chocolate chip cookie. Yes. It is hard to believe. Who wouldn’t want a rich dark chocolate tasting treat first thing in the morning with your #Peets coffee.I wanted more. A lot more. In a very large bowl, combine the flour, hazelnuts or almonds/pistachios, baking powder, sugar, and salt and toss well. Throw in the cold butter and work it with your fingertips until it is small pieces. Or use a food processor. 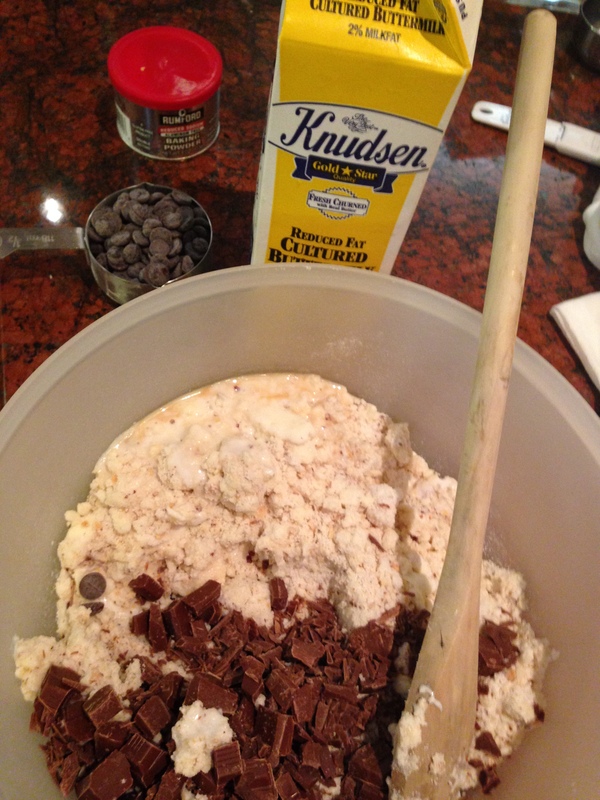 Add the buttermilk, vanilla, and chocolate. Lightly toss to distribute. 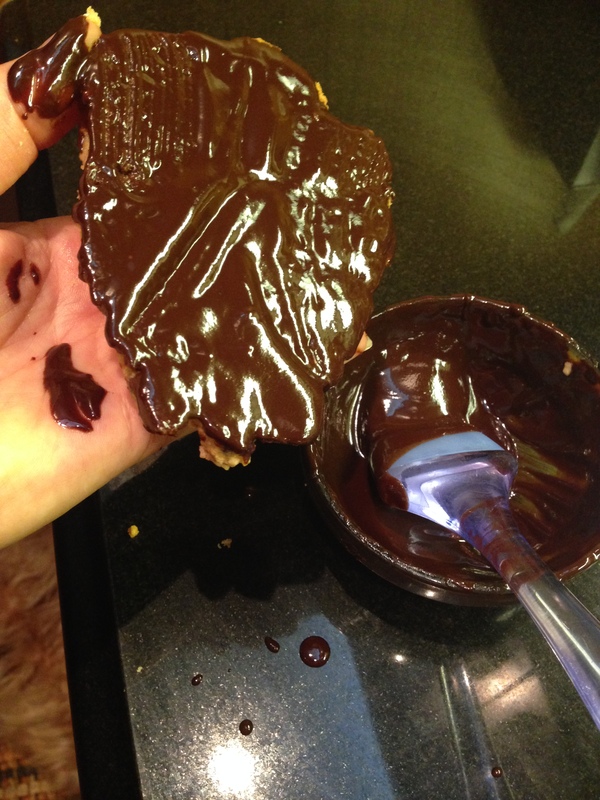 I use food processor instead to mix ingredients, but fold in chocolate pieces with a spatula. 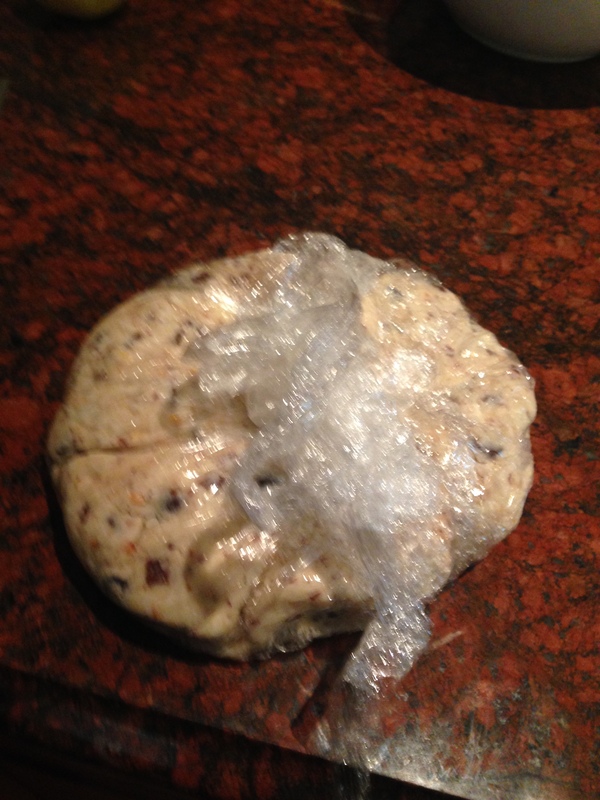 Form the scones into a ball, wrap with plastic wrap and place in fridge for 30 min. Divide dough into 8 or 10 triangles and place onto greased baking pan or pan with parchment paper. Freeze for at least 2 hours before baking, or up to 1 month, tightly wrapped. Remove the scones from the freezer. Brush scones with the heavy cream, and sprinkle liberally with sugar. Bake until cooked through @ 25-30 minutes or brown. 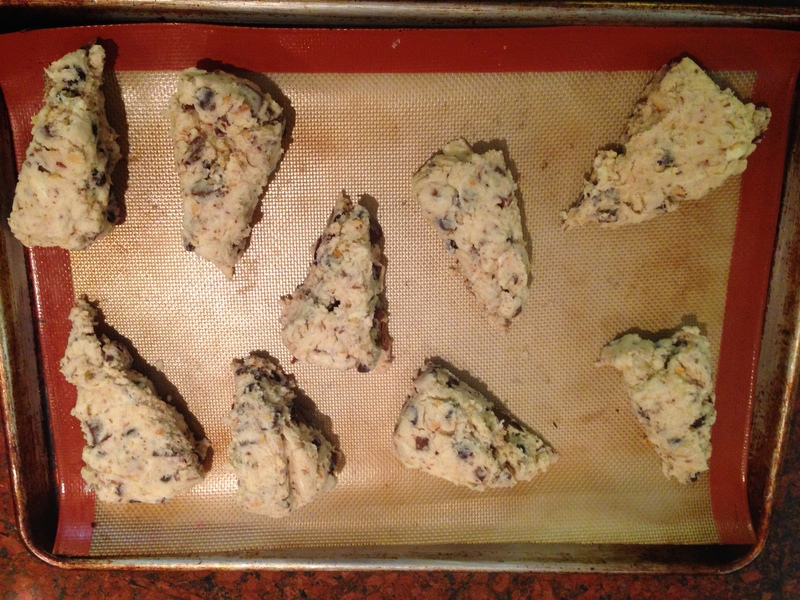 When cool melt extra 1/2 cup chocolate in microwave and brush onto bottom of scones. Place in freezer to set. If you like this recipe, follow me and share. I also welcome comments and questions. Enjoy! Need a Vacation? Avoid the ALS #Icebucket Challenge, Explore Point Arena and Eat Cheesecake! 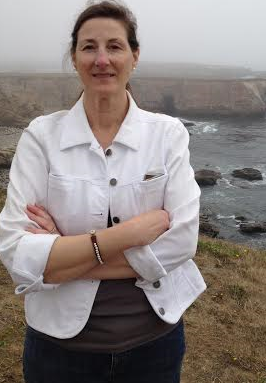 Last Fall, I took a drive to the coast with my aunt Teri. We stayed at a cute B&B called the Coast Guard House Historic Inn. I like to spend time with my favorite auntie. She is the one of the sweetest people you will ever meet and is like a sister to me. We take weekend trips together whenever we can get away so I can spoil her. 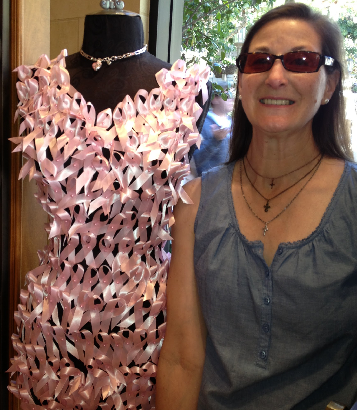 Teri is a 2 X breast cancer survivor. She is my hero. Instead of contributing to these #icebucket challenges, and Relay for Life fundraisers, I use the money I would normally donate as charity to directly make my aunt’s life better. This way we can make memories together and I know she is getting the most out of our time left on this planet. We have been to Calistoga, Santa Barbara, and Placerville together just to name a few. Point Arena California was one of our greatest trips. It is an old town, not far from Mendocino and is where my husband and I spent our honeymoon. The weather is cool and overcast for much of the year, but perfect for getting out of the heat. Luckily, my aunt and I were able to squeeze in time to visit relatives too, which is a huge bonus because they live in the nearby town of Elk. My idea of a good time is checking out the local bakeries. Of course I usually have to taste something and this visit, a slice of blueberry cheesecake was calling me. Oh my! The cheesecake was thick and dense, but creamy and sweet with a touch of tartness from the lemon zest and blueberries. 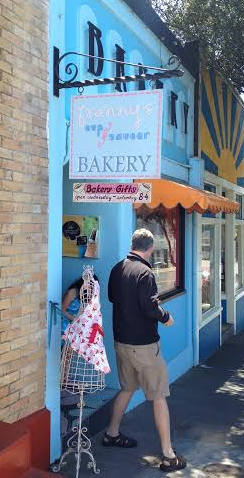 This bakery was adorable and had an extra cuteness to it. You basically wanted to buy everything in the store. You could tell the locals loved making #Franny’s Cup and Saucer a weekly excursion for their cup of Joe and morning pastry. My version tastes just as decadent, but can serve a crowd of people. This cheesecake is baked in a bar pan and made with a shortbread crust. It has an extra layer of crunchy goodness that is missing from a plain cheesecake. I usually use frozen blueberries and make a compote with them by adding ½ cup of granulated sugar, lemon zest, ¼ cup of lemon juice and 1 tablespoon of cornstarch. I wait until the blueberries are boiling before I add the cornstarch and lemon juice. I like this method as opposed to buying blueberry preserves, but that will work also. Cut butter into ½ in pieces. In a food processor, process all ingredients until mixture begins to form small lumps. Sprinkle mixture into a 13X9 X 2 baking pan lined with parchment paper and press down with metal measuring cup. Bake shortbread in middle of oven until golden @ 20 minutes. In a bowl, whisk cream cheese until smooth and add eggs, sugar, zest and vanilla. Evenly spread blueberry preserves/compote over hot shortbread and pour cream cheese mixture over it. Bake in middle of oven until slightly puffed about 30 min. Bars keep covered and chilled for 3 days or freeze them for up to a month. Enjoy! 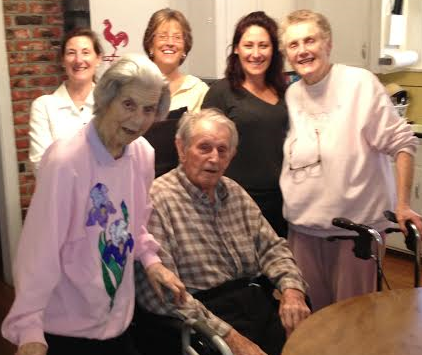 Here is a picture taken with the relatives. Aunt Teri, cousin Barbara, me, my mother in law Nilda, Aunt Nita and Uncle Ted below us. We have since lost our Aunt Nita, but we will always love Point Arena and will keep her in our thoughts the next time we make a visit. Who needs an icebucket challenge when you can make memories with the ones you love. Aunt Teri’s birthday is this week, so we are planning our next girls weekend away. Where should we go this time? That is what I think. Leave me your comments below.